Increased recognition of the natural processes in aquaculture pond system resulted in much interest to apply bacterial inoculum and enzyme preparations to aquaculture ponds for enhancing water and soil quality and for improved aquatic animal production. TerraGard-SP provides gram-negative, facultative chemolithotrophic-heterotrophic strains of Thiobacillus sp, capable of oxidizing sulfide, thiosulfate and strains of gram-positive, spore-forming Bacillus sp. capable of oxidizing sulfide and denitrifying too in the aquaculture pond bottom. TerraGard-SP capable of heterotrophic degradation of a wide array of carbon sources. All of the strains in this formula can utilize carbon dioxide as a carbon source. They also controls hydrogen sulfide and foul odours while degrading general wastes in soil. The target of TerraGard-SP is specific at sediment water-interface on earthen ponds to improve bottom conditions and to create healthy atmosphere for good growth of prawn and shrimp. Probiotic bacteria to break down ammonia is very strong. Allow propagation to occur in anaerobic conditions and through respiration in aerobic conditions. Is a safe source of a single-cell protein, which can be important in aquatic food chains. TerraGard-SP provides live probiotic bacteria and should be handled as such. TerraGard-SP provides greater number of live bacteria, for a strong and effective performance. TerraGard-SP is completely non toxic. Even dead probiotic organisms in Probiotic organisms in TerraGard-SP are beneficial to the fish, as part of their diet. The bacteria carcasses contain many vital amino acids, vitamins and have a high nutrient value. Vitamin B12 is particularly plentiful, as are carotenoids. 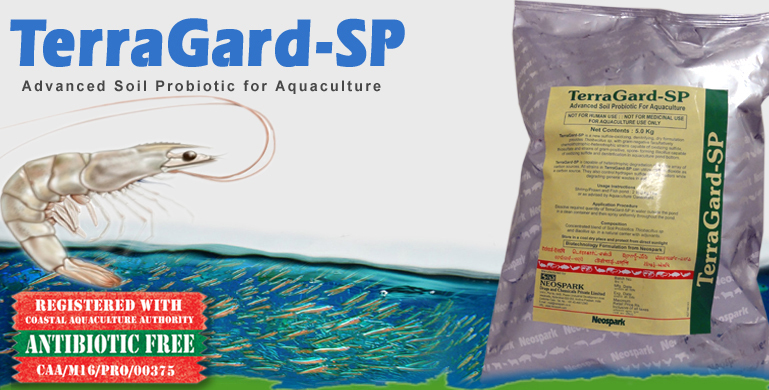 TerraGard-SP improves water and soil quality and increases aquatic animal production. where a shortage of naturally produced extracellular enzymes limits microbial activity. TerraGard-SP reduces discharge loads and improves water quality. Prawn/Shrimp/Fish pond: 2 to 3 Kg/ha. or as advised by Aquaculture consultant. Dissolve required quantity of TerraGard-SP in water outside the pond in a clean container and then spray uniformly throughout the pond. Composition: Concentrated blend of Soil Probiotics Thiobacillus sp, Bacillus sp. having the exceptional capability to remove foul-smelling hydrogen sulfide and degrade organic sulfur compounds without generating the undesirable, toxic gas. Presentation: 1 kg and 5 kg.